We're definitely in between seasons right now on the west (read: wet) coast which has made for some less than inspirational running. Here's what's been happening this week. As Alanis used to say, "Always too hot, never too cold"
After putting in 29 km-plus distances the past few weekends, I ran 23 km on Sunday. Training schedules typically back off on big mileage occasionally to give the body a little break but mentally, I've always found "shorter" long runs to be really tough. Take last weekend, for example. Because I was only supposed to run 23 km I decided to sleep in, leave a little later than usual and be back in time for lunch. Instead, the sunshine and humidity of the late morning combined like a mother f*cker to totally screw me and leave me exhausted. I was hot and absolutely pissed when I decided to literally walk the last three km because I just couldn't take it any more and, quite frankly, I did not care. Over the years, I've found that marathon training is really just a series of good days and bad. It's meant to test a person mentally in order to find the will to finish. Was I tempted, at the end of that dreadful run, to hail a cab or jump on the next bus? Absolutely. Did I? Hell, no. I was finishing that run come hell or high water, either on my feet or crawling hand over foot. Stupid run broke me that day, but I still covered the distance. Ahh. Such is the beauty and disaster of marathon training. In torrents. Buckets. Not as bad as other parts of Canada this summer, but it was still pretty wet, relatively speaking, when you look at this year's summer in Vancouver as a whole. I guess it was bound to happen. But it's not the nice, cool and cloudy rain yet. It's still 24°C out there after factoring in humidity - which makes it kind of unbearable. Well, maybe that's an exaggeration... let me just say, the weather for running in such humid conditions is not comfortable, that's for sure. It's official: I am looking forward to summer being really, truly, absolutely, totally over. No more of this muggy, seasonal transition crap. On the plus side, I've confirmed that my new shoes fit properly (yay!) 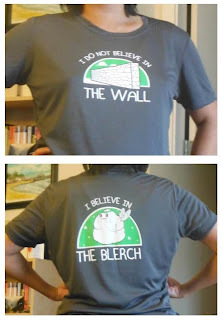 and I got to break in my Blerch T-shirt, courtesy of Matthew Inman a.k.a. The Oatmeal. Or rather, courtesy his shop. Nothing's ever free these days, is it? Still - worth it! Today's run: 8 km, just shy of race pace. Weather: see blog post. Feeling: like I need summer to be over. Roll on, fall! I do not believe in the wall. I believe in The Blerch!